The DBS-44F is similar to the DBS-40F but uses a quad-bar design that accommodates a wide range of large PE pipe sizes from 1” IPS to 4” IPS. The quad-bar lower jaw has four sets of gap stops for the four pipe sizes of your choice. 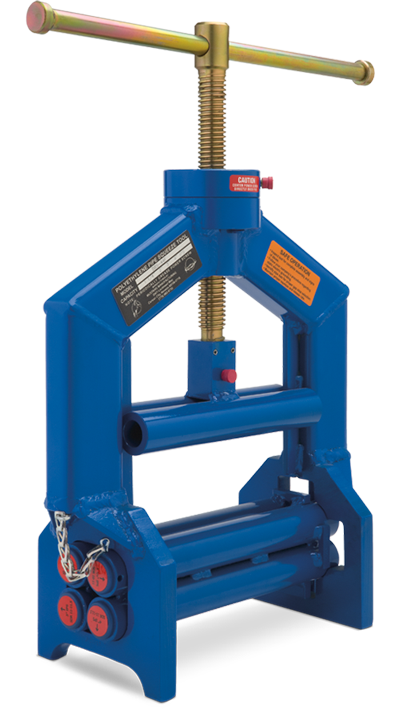 Features include a larger, heavy-duty frame designed to withstand the greater force needed to squeeze today’s PE pipe, while retaining the quad-bar jaw design for greater contact area. A high-strength Acme power screw and replaceable nut is powered with a 24” alloy steel handle. The unique Mustang designed thrust bearing and grease fitting, for lubrication, provides friction free force to the upper jaw. Static electric grounding is accomplished by using an upper jaw grease fitting adapter.